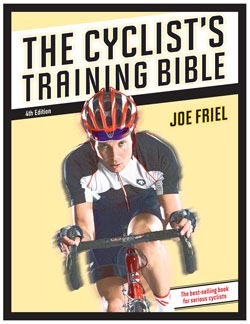 Internationally recognized cycling coach Joe Friel has updated The Cyclist's Training Bible, the bestselling and most comprehensive training book for serious cyclists. New in this fourth edition are updates on all the latest advances in cycling training including training with a power meter, smarter approaches to recovery and fatigue management, a new approach to strength training, and updates to body composition and nutrition. All the charts, tables, and illustrations are now in a two-color format, making The Cyclist's Training Bible even easier to use. The Cyclist's Training Bible has equipped thousands of cyclists for success in the sport. Using Friel's Training Bible methodology, cyclists create a comprehensive, self-coached training plan that is both scientifically proven and shaped around their personal goals. The Cyclist's Training Bible speaks to cyclists of all ability levels, whatever their experience. Friel empowers athletes with every detail they need to consider when planning a season, lining up a week of workouts, or preparing to race. The fourth edition includes extensive revisions on the specifics of how to train and what to eat. Friel explains how cyclists can best gauge intensity with power meters and other new training technology to maximize form and fitness and reduce fatigue, more knowledgeably and accurately make changes to their annual training plan over the course of a season, dramatically build muscular endurance with strength training, and improve body composition and recovery with smarter nutrition. With more case studies to draw from and multiple contingency plans for those times when training doesn't progress as planned, The Cyclist's Training Bible continues to be the definitive guide to optimal cycling performance. Bicycling magazine has called Joe Friel "the most experienced personal cycling coach in the U.S.," and his Training Bible Coaching practice is one of the most respected and successful in the sport. Joe has been training endurance athletes since 1980, including national champions, world championship contenders, and Olympic athletes in road cycling, mountain biking, triathlon, and duathlon. Joe is an elite certified USA Triathlon and USA Cycling Coach and holds a master's degree in exercise science. He is a featured columnist for VeloNews and Inside Triathlon magazines and his articles and interviews appear in dozens of national and international magazines, newspapers, and websites. Joe conducts training and racing seminars around the world and online and provides consulting services for corporations in the fitness industry. He has also been active in business as the founder of Ultrafit, an association of coaching businesses, Training Peaks, a web-based software company, and Training Bible Coaching. He lives in Scottsdale, Arizona. VeloPress is an endurance sports and fitness publisher with books on cycling, triathlon, running, swimming, yoga, nutrition, and the histories and personalities of our sports. VeloPress is the book publishing division of Competitor Group, Inc., publisher of VeloNews, Triathlete, Inside Triathlon, and Competitor magazines and producer of Elite Racing's Rock 'N' Roll marathons and half-marathons and the Muddy Buddy adventure series.